After seeing a black snake at my front door this past summer in full stand up mode, as if he was going to ring the door bell, I’ve been slightly attune to all things snake. It was just a silly garter snake, but it was standing up for goodness sake! I believe in the mythology of snakes, that there is simply something there beyond words. So after viewing an old DVD of Joseph Campbell today where there was an amazing clip of a Buddhist Priestess kissing a king cobra snake three times, I was aghast. 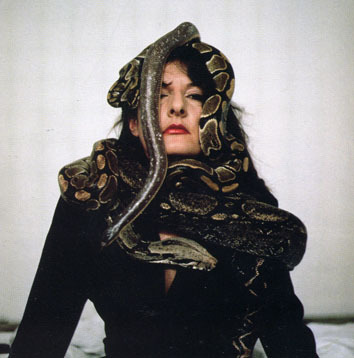 Brushing hair, and kissing snakes sound an awful lot like two of the high priestess of performance art Marina Abromovic’s works. The video where she famously brushes her hair and repeats “Art must be beautiful, artist must be beautiful.” The other where she allows a snake to slither up her neck and head (and nose!!). Myanmar Priestess kissing king cobra snake three times to “help save her village”. PS. I wouldn’t recommend letting 4-year olds watch above video, mine is now refusing to go camping with us this weekend. 😉 Happy Friday! !